To-date there have been three different versions of the Transformers: Generations - Fall of Cybertron Bruticus released: SDCC, regular retail and this "G2"-inspired version. If you weren't around in the early 1990s, you're probably wondering, "WTF is up with the purple camouflage?". Yes, well, back then Transformers had been away for a while, so Hasbro tried to revive the brand by re-releasing the original toys with new, garish color schemes. Bruticus was sold as the individual Combaticons and each figure received bright base colors with purple camo spots. Ridiculous. Tawdry. Absurd. All perfectly acceptable words to describe their new motif. Anyway, I was a bit too young when the original G1 Bruticus was in stores, but G2 hit just around the time I was ten-years-old, so the toys looked "radical" to me. I knew I wouldn't be able to assemble Bruticus on my own, so I enlisted the aid of my cousin and we came to an agreement about each of us buying two of the limbs and then whoever finds Onslaught would buy him and we'd eventually alternate having Bruticus at home. By then several reviews had popped up and I thought, "yeah, I could deal with $60 for a G2 version." I ended up getting mine from BBTS after I cancelled my preorder with Amazon (I went back and forth on the purchase for several weeks). Now, let's remember that I actually prefer this deco to the retail version, itself a horrible palette of inaccurate tones, so I won't go into much detail about the colors. They do seem accurate to the old G2 toy, so I'm happy. Bruticus is of course the combined version of the Combaticons: Onslaught, Swindle, Brawl, Vortex and Blast Off. Each of the robots is made in the "deluxe class" scale, including the leader and centerpiece of the combined robot, Onslaught, who was traditionally a significantly larger robot when compared to the rest of the team. I think this Onslaught being a deluxe figure is the biggest problem with Bruticus. When combined Bruticus is just to lanky. His limbs, especially the lower legs, seem appropriately bulky, but his torso looks way too skinny and weak. The smaller torso also makes his arms look abnormally long. There are rather simple solutions to shorten them a bit, improving his overall proportions, but really what we needed was a bigger Onslaught. He didn't have to be a Voyager, either. Hasbro could just have made him an oversized Deluxe figure, but as-is, he's not even the biggest out of the five! That distinction goes to Swindle who ends up just about half a head taller than Onslaught. Onslaught is one of three figures in the set that end up being to narrow in robot mode (the other two are Brawl and Vortex), which again is detrimental to the eventual combined form. The odd thing is that I prefer this mode over his vehicle mode which barely resembles his in-game model. Yeah. Well, that's what Onslaught is, but the toy does a poor job of delivering anything like that. For one there's a huge gaping hole in the back of the toy. He's more like a Cybertronian Trikke 8 Air with some armor plating. Brawl was one of the two G2 Combaticons I had as a kid, but he's my least favorite out of this set. I should point out that the limb robots have four (yes, 4!) modes each: robot, vehicle, arm & leg. As a leg Brawl mostly works, but since a couple of his panels flip out to form the foot and support the barrels it exposes his combination point making Bruticus' knee look kind of weak. His robot mode isn't horrible looking, but he is terribly back heavy and getting him to stand unsupported is a real chore. For a robot that doubles as a tank, you'd think he'd have a much wider build, but nope, he just ends up with a giant backpack. Brawl's tank mode is actually my favorite of his modes. He's kind of similar to War for Cybertron Megatron, but different enough to make it clear he's a different type of tank. This mode is actually a very close second as my favorite vehicle out of the five Combaticons. His alternate combination mode, as Bruticus' arm, fails miserably. It looks like an arm that's been broken in three places. 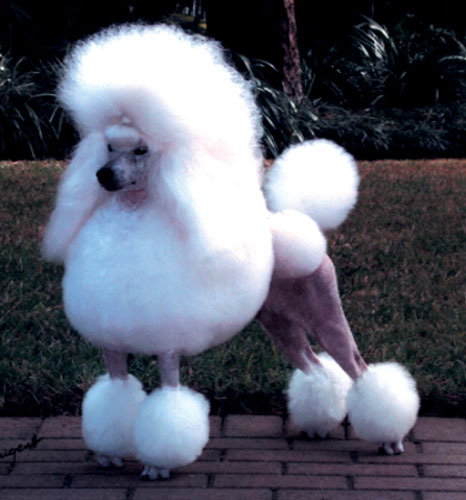 I don't know how the designers thought it would be passable as an arm. It's just a mess. I thought Swindle would easily be the most successful of the Combaticons when the individually carded figures were released at retail mostly attributed to the character's popularity. The toy itself is kind of cool, but Hasbro's new initiative to deliver smaller figures makes Swindle look odder than the other Combaticons. In robot mode he looks bulky and massive when you look at him from the front, but peak around back and he looks like a ridiculously groomed poodle. He looks admittedly cooler as a Cybertronian... 4x4? Armored vehicle? Nevermind. 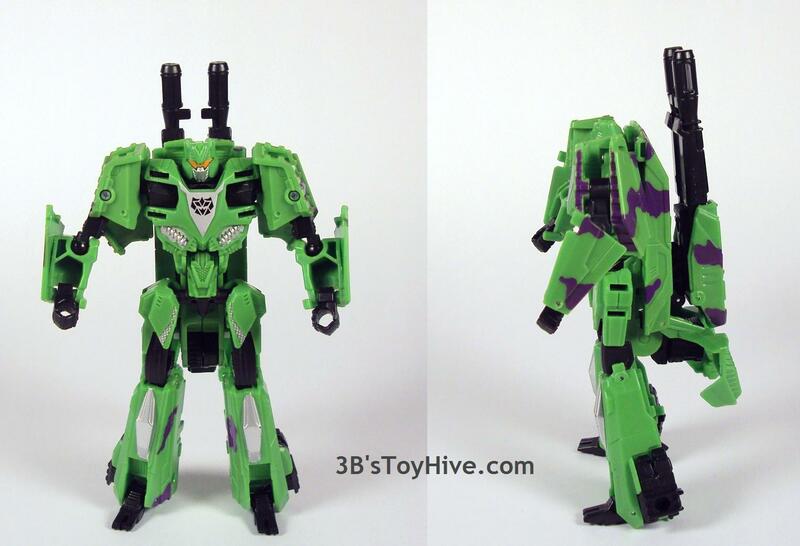 He does manage to look bigger than Onslaught in this mode, too, heck he even looks complete! No giant gaping holes in this design. 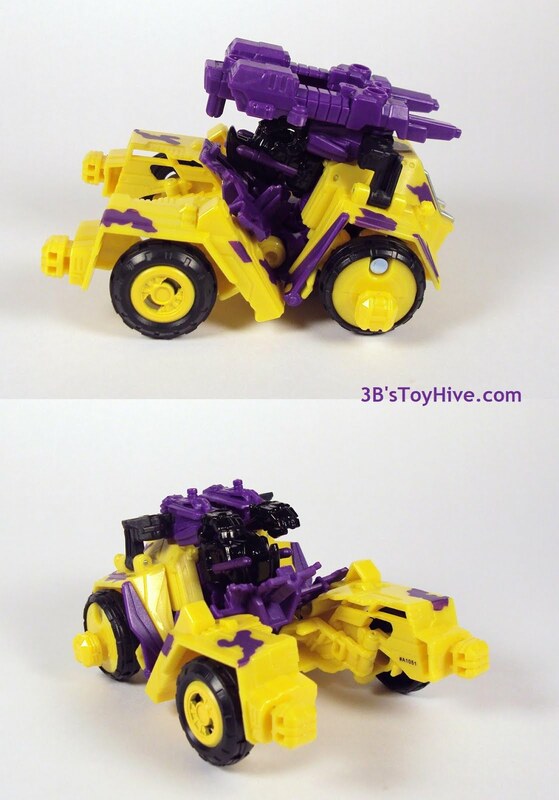 Unlike the other road-based appendages on the team, Swindle looks passable in both leg and arm modes. In fact, his arm mode is probably the best out of the four limb robots, but that's not saying much considering how awkward the others look. It's kind of sad Swindle would make the best arm when you consider Vortex and Blast Off are traditionally the ones who form Bruticus' upper limbs. Blast Off is the other G2 Combaticon I had as a kid. That old toy was very brickish (he was just a redeco of the G1 toy, after all), but this new BO Blast Off is very articulated and his robot mode is actually my favorite out of the bunch. In fact, he's my favorite figure of the five! He's not perfect by any stretch, but he manages to look intimidating thanks to his shielded mouth and spiked shoulder pads. 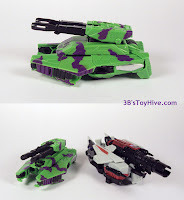 Blast off's alternate mode, that of a space shuttle- er, I mean Cybertronian space shuttle, looks like a massive engine with a cockpit. I think it turned out pretty well, but I always did like space shuttles. I'm glad Hasbro added the silver paint apps on the engine details, giving Blast Off a sort of steampunkish look. Blast Off can be used as either Bruticus' right or left arm thanks to having two thumbs that can be flipped in or out depending on which side he connects to. As a leg, he's not that great. He doesn't have any piece that flips out to form the foot aside from the fins on his engine, so he ends up looking like a massive stump. On the bright side, he does a pretty good job of concealing the combination point thanks to the cockpit. Vortex was my favorite G2-era Combaticon figure. There was something about his light blue color with the purple camo that made him look very cool to me. Plus he was a helicopter Transformer and we didn't have too many of those back then. I envied my cousin for having him. The modern version has an interesting robot mode. He makes me think samurai or gladiator. Like Onslaught he ends up being very narrow, but his arms open up a bit wider at the shoulders so he doesn't look as compressed as the big O. Like Blast Off, his feet are just made up of large sections of his vehicle mode, but unlike Blast Off, there's really nothing to help distinguish where his feet are. Another annoying point is the propellor blades, which are permanently fixed to his left forearm and are always getting in the way. There isn't even a way to lock them in place so they don't keep spinning around. The FoC version of Vortex still transforms into a helicopter, albeit an alien helicopter, and is the one Combaticon in the set that I think could best blend in with Earth vehicles. Well, except for the purple camo. He looks like a heavily armored stealth copter and if he were painted flat black, you'd probably mistake him for a Special Forces vehicle. As a limb I have to say Vortex works better as a leg. Not that he's arm mode is terrible, but when he forms the lower leg he seems better proportioned. In arm mode he's a bit too long. There are ways to shorten him a bit, making him look beefier in the process and that's how I prefer to utilize him. However, the hand isn't doing him any favors. Hasbro avoided having multiple loose parts with Bruticus by integrating the head, feet and hands into the individual robots. Vortex's combiner hand is sculpted in a permanent "karate chop" gesture. The thumb is on a hinge to allow the hand to be used as either the right or left. It may look stupid in neutral poses, but it's way better than the bizarre claws they gave Brawl. Blast Off forms a fist, but I would have liked it painted black. As-is it gets lost in the arm when you look at it. Swindle gets both a left and right hand for his arm mode with semi-closed poses and looks the best. Each robot includes their own weapons which can combine to form the "Sonic Cannon" for Bruticus touted on the box, however, when I think "sonic cannon" I imagine a weapon adorned with some sort of dish. It's probably my exposure to early '90s action figures with ridiculous accessories. Well, there's nothing like that here. There are several ways to combine the individual weapons aside from what the instructions tell you, but nothing that stands out as an imposing weapon. FoC Bruticus debuted this past Summer and this is already the second redeco available of the toy with two more on the way (Takara's version and the retooled Wreckers combiner, Ruination). I don't think he's worth tracking down every version, but I'm glad I picked up at least one of them. Separate or combined, the Combaticons have more checks in the "CONS" column than in the "PROS", but there is some cool stuff here. I think it's great Hasbro is reintroducing combiners, but there's not much more articulation in Bruticus than there was with the Power Core Combiners and I think that's mostly due to Hasbro's decision to give each robot four modes. Had they committed each robot to a specific limb, they could have invested more time in figuring out how to improve the movement when those bots became arms or legs. The funny thing is that Onslaught only has three modes and it seems they cut the most corners on his design. Obviously Hasbro's more concerned with being able to repackage this toy as many times as possible and in that respect, I guess it's good there are alternate ways to combine the figures, but I don't care for Brawl as an arm and Blast Off makes for a crappy leg. I don't know if I'll pick up the Wreckers version, but if I do, they'll most likely follow Bruticus' combination scheme, but probably swap the Vortex & Swindle equivalents around. I hope you Transformers purists weren't expecting FoC Bruticus to blow away those third party combiners, because he falls short next to TFC's Hercules (literally!). But I'm not writing off the possibility of Hasbro coming out with better combiners. I think this is an interesting first step that hopefully won't be the last. In the meantime, I can't wait to see if some third party comes up with a better (and bigger) Onslaught to beef up ol' Bruty here. Want your very own "G2" Fall of Cybertron Bruticus? There's still time to enter Collector DASH Action Figures' giveaway where one lucky DASH member will receive the Transformers villain, brand-new! Click on the Collector DASH button at the top of the page to enter!